Attorney General TJ Donovan says he backs legislation that would soften criminal penalties for simple drug possession. As Vermont looks for new ways to combat the problem of opioid addiction, House lawmakers are considering legislation that would soften criminal penalties for possession of heroin and other drugs. Burlington Rep. Selene Colburn says drug addiction is first and foremost a public health issue. Harsh criminal penalties, she says, aren’t conducive to recovery. So Colburn has introduced legislation that would soften penalties for simple possession of heroin, cocaine and other drugs, by turning felony possession crimes into misdemeanors. The bill has the support of the state’s top law enforcement official. “Do we want to create a class of felons from people who are struggling with addiction, whereby we essentially take away their eligibility to enter into upward mobility in our community?” says Attorney General TJ Donovan. Donovan says existing statute sometimes draws no distinction between addicts, and the people profiting from their disease. The legislation, according to Donovan, would help solve that problem. “I think what we want to do is create the distinction that we know already exists between people who use drugs because they’re addicted to drugs, and people who sell drugs for greed and for profit,” Donovan says. Colburn says the legislation would also create a new felony crime, called possession with intent to sell. The new crime, she says, would ensure people caught with a large amount of drugs could still be charged with felony crimes. The bill failed to meet a key legislative deadline earlier this year. But Colburn says the House Judiciary Committee may try to add the language as an amendment to a separate bill. Dartmouth-Hitchcock Medical Center has released an online "toolkit" to help doctors and nurses better serve mothers with substance abuse disorders and their babies. President Trump's speech at Manchester Community College today about the national opioid epidemic included plenty of New Hampshire references. Trump took time to thank Governor Chris Sununu and Manchester Fire Chief Daniel Goonan for attending. 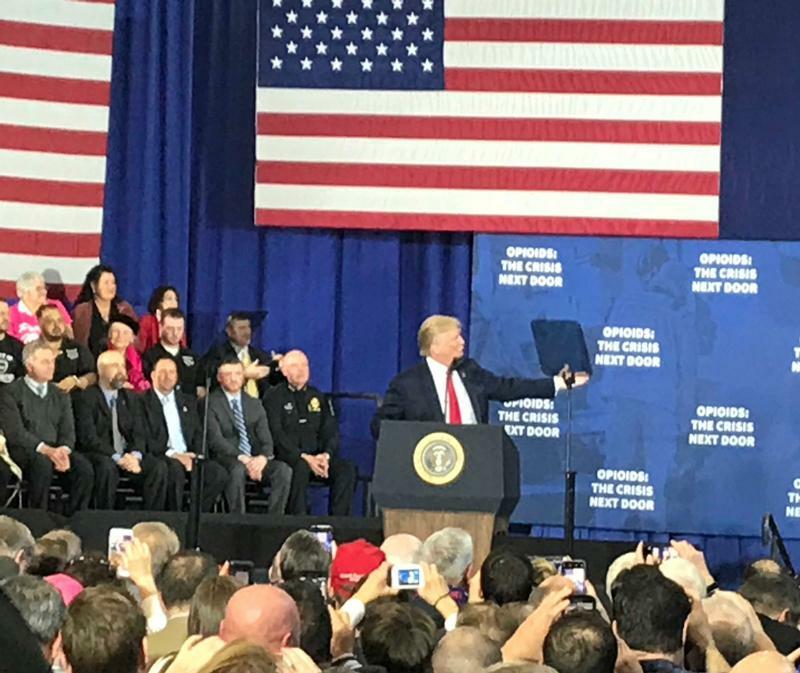 The speech ranged widely on topics including sanctuary cities, DACA and the border wall with Mexico, but the President did not make any specific announcement of new funding measures to fight the opioid epidemic. Trump did make it clear that he wants to see tougher penalties for those convicted of drug trafficking. The number of accidental overdose deaths in Vermont involving the synthetic drug fentanyl increased significantly last year, according to a new report.